Gotta give props to Michelle Mismas of All Lacquered Up, who was interviewed for the Glamour Beauty Blog. Congrats Michelle! 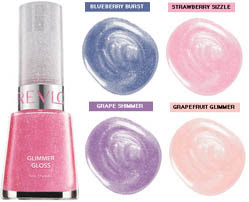 I got a cool tip-off in that interview about a product I didn't know about, Revlon's Glimmer Gloss Nail Enamel. This is perfect for me because, for my nails, I tend to gravitate toward sheer lighter colors with plenty of shine. I would love this in the yummy colors of blueberry burst, grape shimmer, strawberry sizzle, & grapefruit glimmer. These look very pretty!